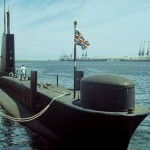 Today in Gosport’s Past:- on 28 March 1988, HM Submarine “Finwhale” (S05) left Portsmouth harbour for the last time, under tow en route to Spain for scrapping. 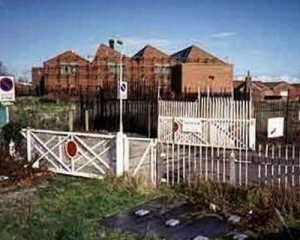 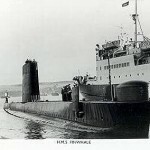 “Finwhale” was the 5th of eight ‘Porpoise’ class submarines, launched at the Cammell Laird shipyard in birkenhead on 21 July 1959, and recieved her first commission on 19 August 1960. 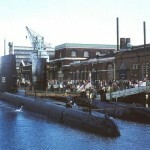 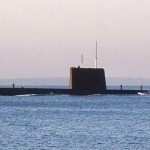 The class was built with an improved type of steel (UXD) which, with improved constuction techniques & design, enabled the class to dive deeper than previous vessels. 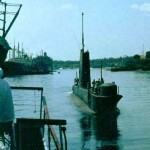 They were equipped with 8 x 21 inch torpedo tubes, and each could carry 30 torpedoes. 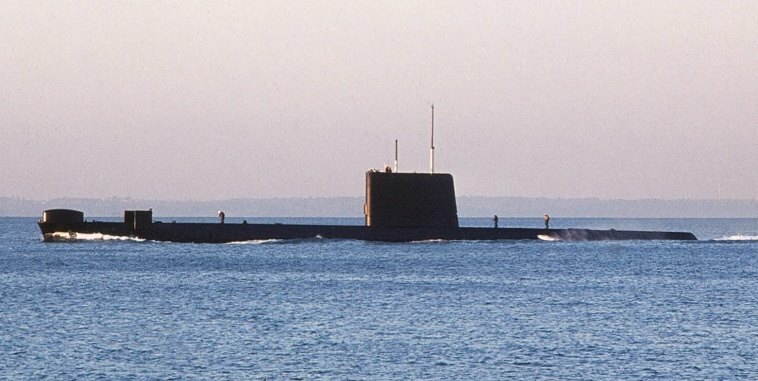 These were the first submarines since the post-WW1 era ‘R’ class to not be fitted with deck guns, although “Finwhale” (at least) was later fitted with an oerlikon deck gun whilst in the far east. 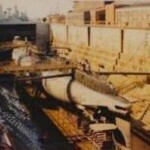 During the early 1960s, “Finwhale” spent five weeks beneath the ice without surfacing during her first commission in the Arctic, thanks to improved air recirculation/cleaning systems. 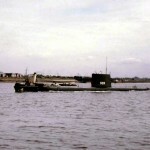 She was recommissioned on 27 January 1964, and in March 1965, she penetrated 95 miles beneath the ice of the Arctic. 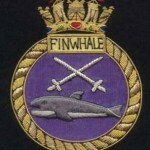 From 1979 until 1987, “Finwhale” was the training boat at HMS ‘Dolphin’, Gosport, and is no doubt a familar name with submariners and their familes.